Promotion is an important time for our 8th-graders, but we must remember that they're still just kids. The promotion party isn't a prom. Promotion isn't graduation. Here are some guidelines for keeping the celebrations within appropriate standards. 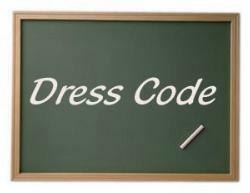 If in doubt about appropriate attire, students may show their outfits to Principal Terry Conde or the vice principal for approval. * Dresses may not be strapless or low cut. No open backs, cocktail dresses, halter tops or formals. No off-the-shoulder dresses. * Straps must be at least 1-1/2 inches wide. * Please wear a dress or skirt that would be appropriate to wear out for a dinner, to a graduation or any place nice with your parents. You don't need to get a formal dress. * Undergarments may not show at any time. * Girls may also wear nice pants or dressy long shorts and an appropriate, nice shirt. * Nice pants or dressy long shorts and a shirt with a collar. * No jeans or T-shirts. AND ... No limousines, please.